For recent college graduates or even those who have been out of school a few years, the lure of that first professional job is very strong. You’re ready to start down the career path and utilize the skills that you have paid so dearly for, both in college and via internships. You also want to be out on our own, start paying off those student loans, and maybe save up for your first home. Regardless of the motivations, that first position is critical as a stepping-stone to the rest of your career. For this reason, young professionals often make the mistake of just accepting an offer that is put in front of them without carefully considering the terms of that offer. 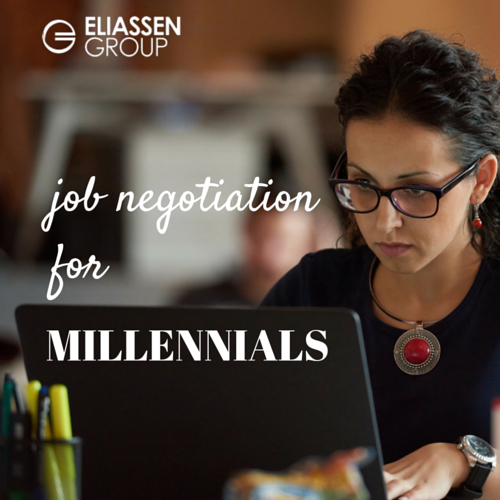 In a recent article by Money Magazine entitled The Costly Career Mistake Millennials Are Making, we learned that “only 38% of millennials negotiate their first salary.” The article goes on to say that, according to a recent survey, “Three-quarters of employers said they could raise starting salary offers by 5% to 10% during negotiations.” So, clearly, unless you raise the issue and are willing to negotiate, you’re potentially leaving money on the table. And don’t forget that salary is just one item for consideration; other benefits such as bonuses, vacation time and stock options are also potential points for negotiation. So how do you know which terms to negotiate? Your personal goals. Obviously, you need to think about your own personal and financial situation. If your main objective is to pay off student loans as quickly as possible, then clearly the starting salary is your most critical factor. Keep in mind that your personal goals will likely change over time so that later in your career, flexible hours might be more critical than salary. The point is that you should continuously evaluate these factors and keep them top of mind as you seek new opportunities. The individual opportunity. Are you considering a job offer with a startup or a Fortune 500 company? And within which industry? These are just a few questions to be thinking about during your evaluation. Within each specific opportunity, there are usually nuances to consider. For example, if the company is a startup that is securing Series B funding, then stock options and flexibility could be key factors in your decision-making process. But if you are thinking about a position with a large public healthcare company, then negotiating a larger bonus dependent upon specific criteria might be a key point for discussion. Lastly, the same article mentions a report from the New York Federal Reserve released earlier this year that states, “lifetime earnings are determined in your 20s, since the bulk of earnings growth happens during your first decade of work.” So leaving money and benefits on the table early on can and will likely impact your earning potential for the remainder of your career. Are you seeking career opportunities and need assistance with the negotiation process? We are happy to help! Check out our careers page and contact us today!